Did you know that more than 30 million Americans have kidney stones? And up to 60% of them formed the stones because they have too much calcium in their urine. That means that if you reduce the calcium in their urine, the stones stop forming. So the big question then is: What is the best way to reduce calcium levels in the urine? Should you reduce your intake of calcium? Or should you reduce your intake of sodium? The answer is obvious, right? Well, not really. Believe it or not, one of the best ways to reduce the amount of calcium in your urine is to decrease the sodium in your diet. Researchers at the University of Parma in Parma, Italy (that's where Parmesan cheese comes from) looked at 210 patients with calcium kidney stones and high levels of calcium in their urine. Half of them went on a low-salt diet. The other half didn't make any changes to their diet. The researchers told both groups to increase their water intake to two liters per day in the cold months and three liters per day in the warm months. After three months, they measured their urine calcium levels. 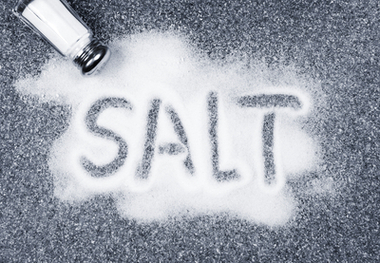 The levels in the low-salt group were 25% lower. In fact, 62% of the patients in the low-salt group had healthy calcium levels in their urine at the end of the three months. Whereas half that many became normal in the increased water only group. The most likely explanation for why a low-salt diet lowers urine calcium has to do with the kidneys. The mechanism in the kidneys that retains salt and thus lowers the urine salt levels is the same one that retains calcium and lowers the urine calcium levels. Therefore, the less salt in the urine, the more calcium gets retained and the lower the levels are in the urine. So if you have had a calcium kidney stone, get your 24-hour urine calcium level checked. For men, your level should be below 300 mg. For women, your level should be below 250 mg. If it is over the limit, one of the best ways to get it under control and prevent any more stones from forming is to cut out salt and drink at least two to three liters of water each day. I have reported to you before that surprisingly, cutting back on calcium does not lower the urine calcium levels. The low-salt program in this study consisted of eliminating all added salt to foods as well as avoiding foods high in salt. You can get a good idea of what foods these are at the Mayo Clinic web website, www.mayoclinic.com. Enter "low-salt foods" in the search engine and you'll see what you should eat. Publisher's Note: We wanted to congratulate Dr. Shallenberger, who is being honored by the Arizona Homeopathic and Integrative Medical Association with a Lifetime Achievement Award in Integrative Medicine. The award is for his pioneering work promoting and researching ozone therapy. This is an opportunity for Real Cures readers to meet with Dr. Shallenberger at the VIP reception and awards dinner. The event is in Phoenix on December 7, 2013. Readers who are interested in attending can learn more and reserve a seat by calling 602-263-3589. REF: Nouvenne A, Meschi T, Prati B, et al. Effects of a low-salt diet on idiopathic hypercalciuria in calcium-oxalate stone formers: a 3-mo randomized controlled trial. Am J Clin Nutr. 2010 Mar;91(3):565-70.